if it's not rain, it doesn't belong in the drain! DO YOUR PART TO PREVENT WATER POLLUTION AND ADOPT A STORM DRAIN TODAY! when it rains, stormwater carries dirt, debris, and trash to our storm drains. these drains can dump polluted water directly into our lakes and rivers, untreated or they can get blocked and cause SERIOUS flooding issues! Not only does this have a very negative impact on wildlife, it has a major financial impact on our lives. With that said, the easiest way to clean up our lakes and rivers is to prevent them from becoming polluted in the first place! This is where the adopt-a-storm drain program comes in! Through this program, we provide tips, resources, and a way to map drains that have been "Adopted". Rain or melting snow tend to wash soil, litter, pet waste, fertilizer, and lawn clippings off the pavement and into your storm drain. 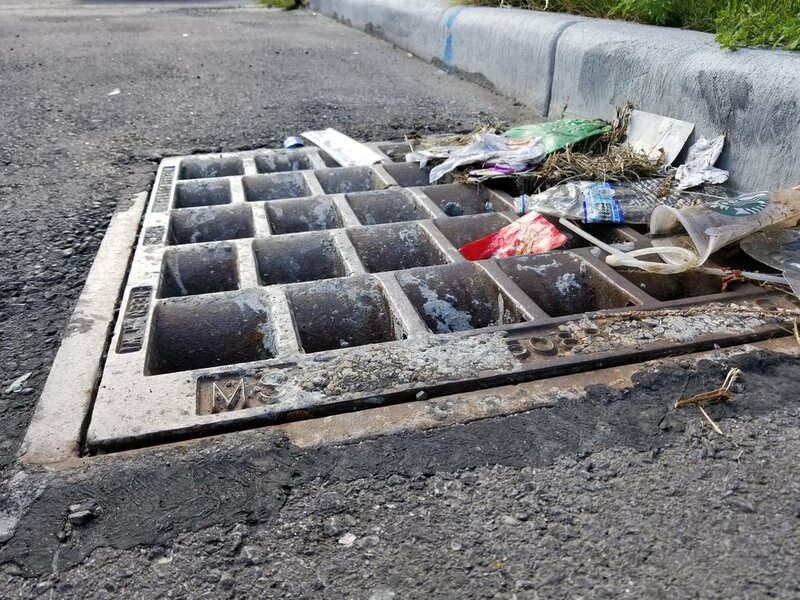 When the storm drain empties into lakes and streams, these materials become pollutants that can kill fish, close beaches, and increase weed and algae growth. For more information, visit our page on Stormwater Pollution. The most effective way to reduce stormwater pollution is to stop it from entering the system in the first place. Everyone can make a difference just by picking up after their dogs, keeping leaves and other yard waste out of the street, using less lawn fertilizer and chemicals, attending to car leaks, and throwing away litter. The Adopt-A-Storm Drain program is an opportunity for individuals in Southeastern Wisconsin to prevent water pollution right from their homes. Even if you don't live near a creek, river, or lake, that does not mean you don't have a direct impact on the health of those waterways. Adopt a drain today and prevent pollution from getting into our water! HOW DO I ADOPT A DRAIN? It's easy! Adopting a drain doesn't require a formal agreement or a list of requirements - we won't even send you anything! By adopting a drain, you agree to prevent pollution from reaching storm drains by keeping the area around drains free from debris and by following our simple tips. Simply provide the location of the storm drain with an approximate address and we will add your drain's location to the map below! See the video above for news coverage by TMJ4 about the Adopt-A-Storm Drain program! Sniff out a storm drain near you! Help our spokesdog, Sparkles, and other residents in southeast Wisconsin protect water quality by adopting a storm drain today! Although keeping one or two storm drains clear of debris might not sound like it will make a big diffence, imagine if every person in southeast Wisconsin adopted a storm drain. That would make a TREMENDOUS difference in preventing stormwater pollution. Do your part and adopt a storm drain, today! 3. Send us the general location of the drain so we can mark it on our map! Adopting a Storm Drain is easy! Enter your email below and we will contact you to confirm the location of your selected storm drain. We promise not to share your email or send you annoying messages! Why is it important to keep our storm drains clear of debris? Rain or melting snow tend to wash soil, litter, pet waste, fertilizer, and lawn clippings off the pavement and into your storm drain. When the storm drain empties into lakes and streams, these materials become pollutants that can kill fish, close beaches, and increase weed and algae growth. For more information, visit our page on Stormwater Pollution. By adopting a drain, you agree to prevent pollution from reaching storm drains by keeping the area around drains free from debris and by following our simple tips. Simply provide the location of the storm drain with an approximate address and we will add your drain's location to the map below!